2019 Update: I’ll revisit the bridge and therefore this page again in the future. It needs help. As a family, we’ve gotten used to going on “adventures” just about every weekend. We’ve found that it’s very beneficial for Damian as he’s almost always good in the car and seeing new and different things usually keeps him in good spirits. I’ve had fun planning these excursions and, as if I have to tell you, CTMQ certainly benefits from our efforts. It’s good for the site, good to add content, good for Damian’s psyche which is turn is good for Hoang’s well-being. But the onset of winter poses problems. The drives aren’t as pretty, the attractions are no longer open and futzing about outside becomes more difficult. However, we must trudge onward. And so, it often happens that Hoang will look at me around 9AM and say, “Where are we going on our adventure today?” and I dash upstairs and plan an approximately three-hour trip. Such was the case on a late November Sunday after Thanksgiving… But I was stumped. For whatever reason, I had no plan of attack. 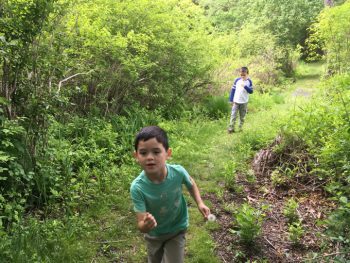 I poked around the best resource I know of (This awesome site), mapped out a loose plan and we hit the road to the northwest hills of Litchfield County. I love the drive out Route 44 once past Winsted, though I must admit it’s far better in the Spring, Summer and Fall than it is in (near) winter. The drive through the backwoods of Norfolk, Colebrook, and Canaan are just so completely different than the rest of the state; I love it. 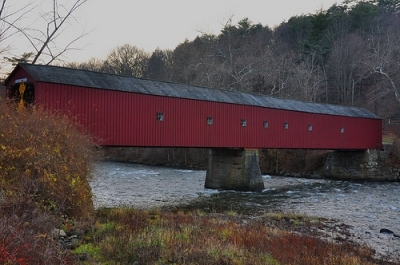 After a few stops here and there, we made it down Route 7 – which itself is a great drive along the Housatonic – to Cornwall and its famous covered bridge. 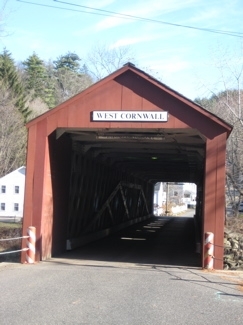 There are only three “real” covered bridges in Connecticut and one of them is closed to traffic. The other two have been slightly modernized. I’ve always liked the romance of these things. This one, also known as the Hart Bridge, is rather dangerous to access out of the car – and even somewhat sketchy while driving. It’s not the one lane aspect of it, but when approaching from route 7 north, you can’t really see if anyone is coming across from the other side. But we survived. 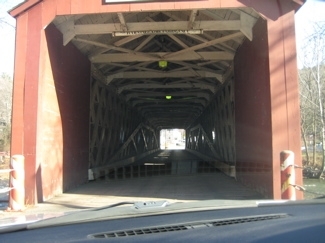 West Cornwall’s covered bridge is an excellent example of the Town lattice truss, with its red-spruce timbers secured by a pair of treenails (slotted and wedged to hold them in place) at every intersection. For many years it was thought that this bridge was built in 1841 to replace one washed away in the flood of 1837, but recent research by Michael R. Gannett for the Cornwall Historical Society has shown that the correct date is 1864. The center pier supporting the middle of the bridge was probably reused from the earlier structure. One source gives 1887 as the date when a secondary queen-post truss was added, probably to stiffen the bridge, since wooden trusses had a tendency to sag. Located at the intersection of Route 128 and Route 7, spanning the Housatonic, the bridge is 172 feet long and a scant 15 feet wide. In 1973 the Connecticut Department of Transportation rehabilitated the bridge by inserting a concealed steel deck to bear the weight of the traffic. The project won the Federal Highway Administration’s outstanding historic preservation award. The bridge was listed on the National Register of Historic Places in 1975. 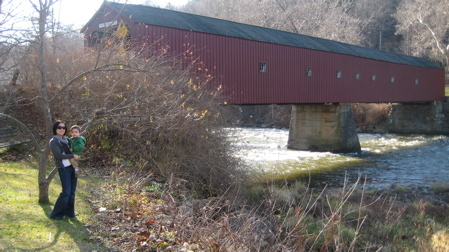 Early covered bridges had simple constructions of trusses, which became more complicated as tougher problems were solved, and craftsmen evolved and patented designs. 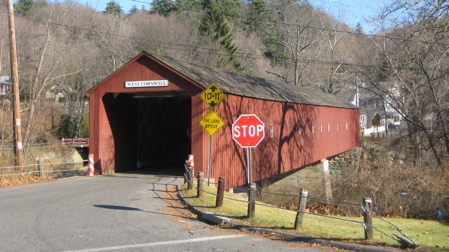 While covered bridges can be found in many regions of the U.S. and Canada, New England and Pennsylvania are particularly well known for their abundant collection of preserved bridges. Of the tens of thousands originally built in the 19th century a little over 800 survive in the States. But why cover them? After all, this added considerable expense and time to the construction. Well, much speculation has been put forth on this topic, which includes providing romantic opportunities to steal a kiss, and shelter for people and animals caught in a storm when traveling. No doubt about it, these are all side benefits of a covered bridge. But the simple answer is protection against the weather for the bridge. Here in New England, where I live, covered wooden bridges last about three times as long as those exposed to the elements, and reduces bridge maintenance as well. So, at least in the Northeast, the harsher climate tended to warrant the covering of a bridge. During the 19th and early 20th century very few bridges built were not covered. Historians believe the red coating makes the bridge seem more like a barn to a horse, and as horses tended to be skittish about crossing high over flowing water, the illusion helped farmers and travelers navigate the obstacle with little incident. *Depending on how you measure it. Were any of these covered bridges featured in ‘Bridges of Madison County’?